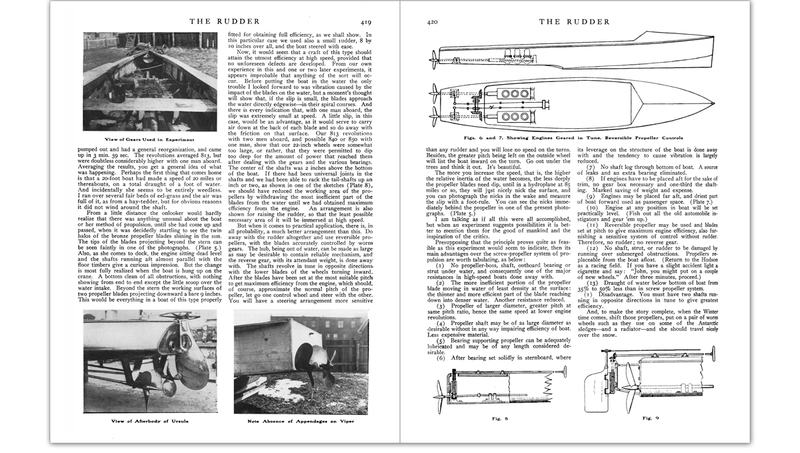 The most commonly recognized innovation of inventor and boat designer Albert Hickman is the inverted V hullform he patented and brought to market as the Sea Sled in the mid 1900s. Dan Spurr’s article “Tough Sledding,” in Professional BoatBuilder magazine No. 178, traces the persistent updating efforts of yacht designer Jim Kyle as he refines the Sea Sled form for modern construction and markets. A bit of time in the WoodenBoat Publications library revealed that Kyle is not alone. Indeed, the undeniable efficiency of the hull type has drawn steady interest from naval architects and engineers over the decades despite some persistent performance and handling quirks. With the help of research librarian Pat Lown, I also found that Hickman’s obsession with efficiency didn’t stop with hull design. In a 1911 article he wrote for The Rudder magazine, Hickman describes the research into surface-piercing propellers he conducted in his less-than-sound test boat Viper. His description of the efficiency gained by having only the tips of the lower blades in the water is marvelously clear. And his account of the hands-on testing of the theory in a leaky boat on the river between the first snows of the season is a reminder that innovation comes most bountifully from those who put their ideas to the test immediately in spite of impracticalities. Hickman’s narrative was remarkably like Spurr’s reporting about his own days on the lake with Kyle, testing variations on the Sea Sled, and altering the hull shape with a grinder and body filler overnight. Thanks to Lown and PBB art director Blythe Heepe, we have scanned and sharpened Hickman’s original text and share it here with our readers who have an appetite for first drafts of good ideas.